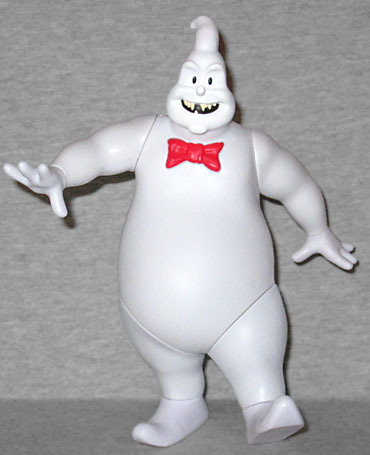 It would be very easy to paint the antagonist of the 2016 Ghostbusters as simply the gross stereotype of a depressive MRA Redditor; the short, chubby, whiter-than-white Rowan is as sneeringly condescending and confrontational as possible, eager to tell anyone who will listen about how great he is and how everyone else will be punished for their insolence. But the film, unusually empathetic, takes great strides to point out how he, and Abby/Erin, are two sides of the same coin: all considered outcasts and all laughed at because of their beliefs/interests, but where the latter use their knowledge to do something constructive and helpful to others, he has to lash out at the world, in a pathetic attempt to get what he thinks he is earned. Prior his horrific gigantification, Rowan North is an occultist and former Mercado Hotel employee. Obsessed with the supernatural as well as his hatred towards others who mistreated him throughout his personal life, he sought to achieve revenge and respect by bringing out a series of catastrophic paranormal activities on a mass scale which he strangely calls the "Fourth Cataclysm" via his occult machine which connects the ley lines within the New York area to the Mercado Hotel in Times Square and breaking down the barrier between worlds. At the beginning of the film Rowan is merely a nuisance, moling around the city hiding his little technological devices that make ghosts happen. It isn't until the final act in which his plans come to fruition that he becomes the physical manifestation of the Ghostbusters' logo as a gigantic weapon against the city and the Ghostbusters. (Note the film also points out that he couldn't have pulled any of it off if not for their research. Average male schlub takes credit for women's work!) This "final form" is the basis for the Build-a-Figure reviewed today, a piece of which came with each of the Ghostbusters figures. It may seem pointless to make Rowan the BAF when there's already a Rowan figure in the regular 6" line, but you have two ways of looking at this: one, Mattel is being dumb; or two, Mattel recognized that the people who would want to buy all four Ghostbusteresses might not want to buy a toy with a silly light-up feature, and so made sure we collectors still had an opportunity at the film's big bad. After all, no one's making you buy the single-carded version. If you had to buy that one to get a BAF piece of this one, now that would be evil! 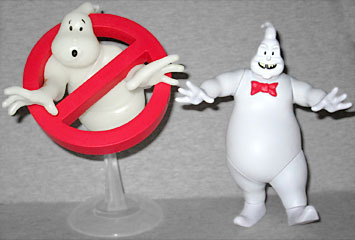 Rowan stands about 6" tall, moulded nearly entirely in white paint to give him the very 2D ghostly effect seen on the Ghostbusters logo, but not really close to the oversized-hessian-sack look he had in the film. This is definitely on the cheaper-end on the Build-a-Figure scale - fortunately, the figure looks quite good, despite the simplicity of the sculpt. Rowan is instantly recognizable as a demon based on the logo, with his face smiling an evil tooth-baring grin. The paint, here, is at a minimum, with only the face and the bow tie differently colored from the rest, but this isn't a drawback: he looks like a cartoon demon, very much the way he did shortly before embiggening. Here's a toy that can mix not only with the 2016 figures, but with your previous Mattel Ghostbusters toys as well as any '80s Real Ghostbusters figures you have. Articulation disappoints; Rowan is limited to swivel joints that barely improve upon the Springfield Four, with movement at the neck, shoulders, wrists, and ankles. 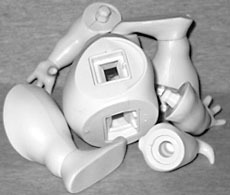 From a glance it looks like he would have movement at the thighs, but this is where the BAF pieces fit together and prevents movement - they plug in with large rectangular tabs, and only have one proper position. At least this keeps him stable on his feet via the preposing. 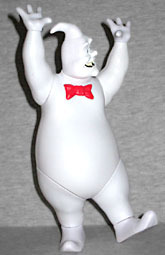 Still, he can move his arms some to create some different poses, and this is honestly better than the original Real Ghostbusters ghost toys had. In the film, Rowan was enormous, the size of buildings, and clearly the Build-a-Figure is not nearly in that kind of scale. He's still a ton of fun, though, if you want to pit him against any of your 'buster figures or your Minimate or Lego Ghostbusters. I see this figure as a bonus of owning the four 2016 Ghostbusters, and with that in mind he's a great toy to have. Those looking to have a more screen-accurate, larger Rowan might want to look out the upcoming Japanese Bandai vinyl figure that stands an impressive 12". Otherwise, this Rowan will do in a pinch!